Those aware of the arguments against kneeling in church on Sundays not only from Pascha to Pentecost but every Sunday know about not only the canonical prohibition against kneeling on Sundays, but also how it was an ancient tradition of the Church kept for centuries until modern times when western devotional practices overrode this ancient tradition in many parishes. Besides these powerful arguments, however, there is still one that is more powerful that I have never personally seen addressed. For those who kneel on Sundays, you know the routine. During the consecration of the Holy Gifts, specifically the epiklesis of the anaphora, when the bread and wine are made into the Body and Blood of Christ, you kneel in devotion before the awesome mystery. Though this has long been the traditional practice for every other day of the week, on Sundays it was always prohibited, until, as we said, recent times in many though certainly not all parishes. But do all the people in fact kneel where kneeling is the practice? I have attended dozens of parishes over the years on Sundays around the United States, and in those in which it is the practice to kneel during the epiklesis, I have made one observation in every single one of them during this time. It is as follows: Not Everyone Kneels During the Epiklesis! Personally, I never kneel on Sundays. It is something I cannot do with a clean conscience. I know that it is a western devotional practice foreign to Orthodox piety and tradition. I know when it started, who started it and why. When I visit a parish, I always stay in the back, and remain standing during the epiklesis. Usually I'm not the only one. Many people can't kneel, so they stand, and many stand out of conviction to what they know to be the correct Orthodox practice. 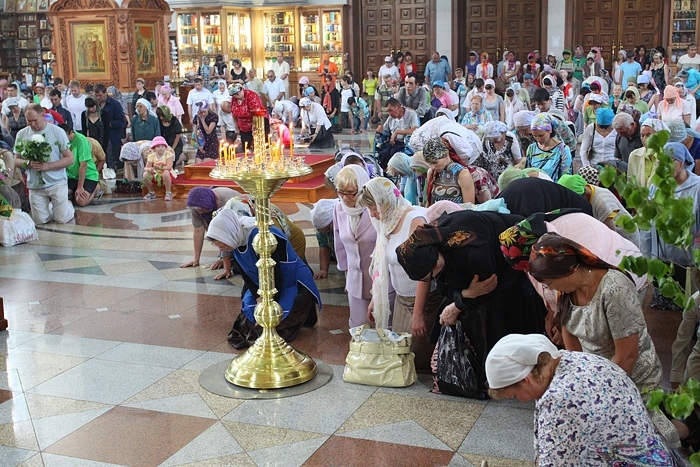 And it should be noted, the vast majority of Orthodox Christians around the world do not kneel on Sundays. Though this is a powerful argument against kneeling, it is not the most powerful. The most powerful argument against kneeling on Sundays is something you can't help but observe when you stand in the back behind everyone else, even though I slightly bend in reverence and close my eyes during the prayer. It is something probably most priests are not aware of, because they are concentrating on the consecration, and looking away from the people at the time. But if you stand in the back of a parish where the practice is to kneel during the epiklesis on Sundays, you will likely observe the same thing as everyone is getting into position. As everyone bends down to supposedly kneel, they don't. What many do is something I consider far worse from a canonical and traditional and devotional point of view. What do they do? They Sit! Yes, when you think everyone is kneeling, or at least standing, many are usually sitting down in their seats or pews. This is something I have observed in every single Divine Liturgy I have ever attended where it is the practice to kneel on Sundays, and even though I am accustomed to ignore it for the most part, nor do I judge the people that do it, it still unsettles me that this issue has never been addressed or taken seriously by those who can take control of the situation, namely the clergy. I first became aware of this was when I was 16 years old and attended a Pentecost service in Athens with my grandmother. This church had hard marble floors, and since it is required to kneel during the Vespers Service of Pentecost after the Divine Liturgy (which doesn't count as kneeling on a Sunday by the way, because it is officially a Monday service), everyone came prepared to kneel coming to church with small pillows to not hurt their knees; everyone except my grandmother and I because she was not familiar with this parish. It was the first time I saw such a thing, and I was impressed by everyone coming to church prepared knowing what to expect. However, my grandmother could not even kneel on a pillow because she had knee problems, so she told me that she would sit down during the kneeling prayers. In my mind I thought that surely this would be fine, since she was physically unable to kneel and probably did not want to be a spectacle. As for myself, even though I was one of the unlucky ones to not have a pillow, I knelt on the marble floor and endured every second of the pain, realizing then why everyone made sure to bring pillows. The pain reminded me of visiting the old refectory at the Monastery of Saint John in Patmos, where I was told the monks centuries ago had to eat on their knees on a stone seat, which can still be seen today. When I tried kneeling on the stone, I only endured about five seconds of it. Though its not quite like kneeling on broomsticks like medieval monks used to do for mortification, but kneeling on a thick marble floor can do damage to the knees after some time. This experience made me wonder how all the elderly in parishes handle the requirement of kneeling on Sunday in America as most Greek parishes do. When I returned home and attended the Divine Liturgy one Sunday, I decided to observe out of curiosity, and I was shocked to see that not only did most of the elderly sit down in their seats at the time of kneeling, but many younger middle aged people, even teenagers, sat down in their seats instead of kneeling on the cushion provided by the pews over a carpet. It wasn't even a marble floor! At the time I was not shocked by the fact that it was prohibited to kneel on Sundays, because I was too young to be totally aware of the prohibition, but I was shocked by how many people actually sat down during this sacred moment when it was expected for everyone to at least kneel, even though most were physically able to kneel unlike my grandmother who could not as well as many elderly or those with physical ailments. And so over the years it has become routine that during the epiklesis, most people kneel, many people sit, and some stand. I have attended parishes however where about 80% of those in the pews sit during the epiklesis, including those who look strong and healthy. There is never uniformity. In a small church with not many people, you may get uniformity, but this is rare. However, if everyone was required to stand during the epiklesis, I can pretty much guarantee there would be uniformity and less confusion. It is a very simple solution. And this is what I consider to be the most powerful argument against kneeling on Sundays. Despite it being a practice for many decades, not all people do it, sometimes most people don't do it, so why do it?